Fontaine Modification Acquires ProBilt Services Of Ohio Inc. Yesterday, at Heavy Duty Aftermarket Week, Fras-le North America announced changes to its hydraulic product offering for commercial vehicles, as well as the launch of a copper-free air disc brake pad line called GRN Tech. 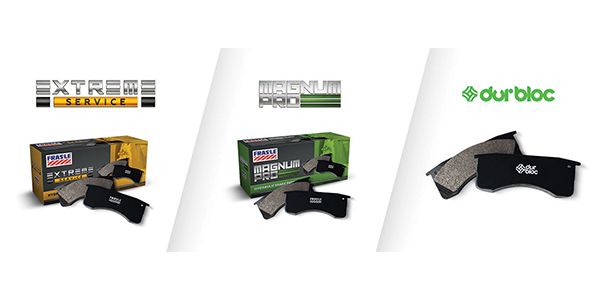 Fras-le has expanded its line of hydraulic brake pads to include what it describes as “a full range of exceptional material grades.” The improved portfolio contains innovative improvements to the Magnum Pro and Extreme Service families, as well as the addition of a new aftermarket value material called durbloc. “The addition of durbloc to our hydraulic brake pad lineup is an exciting direct response to the market’s demand for a high-quality, value cost option from Fras-le,” said Bob Harrison, senior vice president of sales and marketing for Fras-le North America. Fras-le’s full range of hydraulic brake pads can be purchased from the company’s U.S.-based distributors. After years of intensive engineering at Fras-le’s state-of-the-art research and development center, GRN Tech was produced to serve as an effective and environmentally friendly product. Not only has it been tested on various terrains at Fras-le’s proving grounds in Brazil, but it also has produced exceptional results in several other countries, according to Fras-le. In addition, the company announced it signed an agreement in October 2018 to buy all the shares of the company Jofund S.A, holder of the Fremax brand. Fremax is recognized as a premier manufacturer of brake discs, drums, and wheel hubs for OEM and aftermarket companies. Fras-le representatives stated that this acquisition will allow the company to provide an expanded line of rotors in North America. Early product offerings will include a limited amount of premium rotors for the top-selling commercial brake systems in North America for medium- and heavy-duty vehicles. In the past few years, Fras-le had its largest expansion in the international market throughout its 65-year history, strengthening its business in North America. Worldwide, Fras-le’s presence has grown and expanded to have an established presence in various markets. “The past couple years have been defined by Fras-le as a period of alliances, development and global expansion because the company believed in the power of collaboration for growth and now faces new challenges with modern systems and a strong commitment from our team,” said Pontalti. In addition to gaining the Fremax profile, this period of collaboration also led to the acquisitions of three companies from Argentina and Uruguay called Armetal, Farloc and Fanacif. In parallel, ASK Fras-le Friction was created in India to supply markets in India, Bangladesh, Nepal, Sri Lanka and a few other countries. Internally, the China facility doubled in size and a new sales office and distribution center were established in Colombia. Fras-le’s full hydraulic brake pad lineup and other brake pad and lining products are on display today at the HDAW tradeshow at booth No. 229.